At 5pm every evening, a plump, middle-age flower seller at the Ganesh Temple in Kamaladi brings out three pots of rice, dal, and meat. 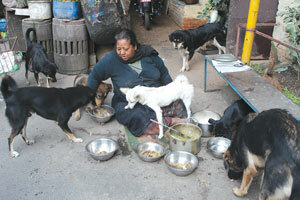 She sits on a mat on a corner of the street, and feeds her furry four-legged friends. 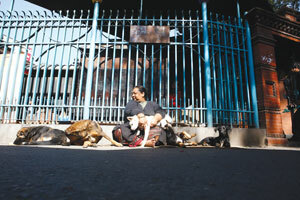 Like a mother tending her children, Gyani Deula talks to her 21 dogs, coaxing them to eat up. She heaps ladles full of rice and curry into their bowls. Bijuli is one of the shier dogs who prefers to eat alone, so Gyani gets up to feed her separately. Gyani has lived on the temple grounds all her life, after being abandoned by her family she has found canine companionship more rewarding. "The dogs have been more loyal, caring, and protective than any friend or relative," says Gyani, hugging Sweety. 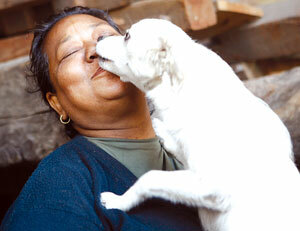 Gyani started adopting dogs three years ago after she found abandoned puppies in a carton dumped near the temple. The 54-year-old makes a meagre living selling flowers to pilgrims and sets aside part of her earnings to buy food for the dogs. The Seto Machhendranath committee pays her Rs 1,000 a month to look after the chariot, and others helped set up her flower stall. Gyani adopts every dog that is dumped at the temple, and takes care of them as if they were her own children. The 21 dogs are all registered with a nearby vet, and Gyani makes sure they get their shots and the females are neutered. The dogs get a breakfast of milk and biscuits and even a bowl of Pedigree dog food. The puppies are handfed with human baby food and eggs. All this costs Rs 7,000 a month, and she still owes the vet Rs 5,000 for the shots. Gyani's son and daughter-in-law left her because they couldn't handle the attention and resources she was devoting to her pets. "It's difficult, but I will provide for them until I die, they are my family," she says matter-of-factly. "I worry about them once I am gone, what will my babies do? Who will feed them and love them?" Gyani knows the names of all her dogs by heart. "That is Khaire, Kali, and Gore," she says, pointing out the mostly-female mongrels, "and those are Amitabh Bachchan, Rekha, Sweety, Bijuli, Naulo, and Bhakta Bahadur." Despite the fact that dogs are gods in Nepal, and are worshipped this year on Kukur Tihar on Tuesday 13 November, hundreds of mongrel puppies are discarded on the streets of Kathmandu every year. Gyani's dogs are gentle and friendly, even with strangers. They like to playfully chase bikes that circle the temple which they guard at night. They get up at four every morning, lining up in front of the temple and howling in unison as the priest rings the bell. The dogs are all devoted to Gyani, they pull at her sari if she is going out on an errand, and sulk when she is away. At night they sneak into her tiny room and snuggle at the foot of her bed. As it got dark one evening this week, Gyani set out mattresses and blankets for her dogs under the shed where the chariot wheels are stored. Gyani has seen people in fancy cars stop, dump the puppies on the sidewalk, and go inside the temple to pray. Threading a marigold garland, Gyani says: "What kind of dharma is that? God will punish them one day for their cruelty." Hats off to the lady. We should be inspired from what she has done..
Gyani, may you live a thousand years and be able to continue to comfort and care for "man's best friend" that our hypocritical society pretends to worship one day in a year (kukur tihar) and abuses all the other days. I have seen how cruel Nepalis can be to stray dogs--kicking them, throwing rocks at them, and sometimes even cutting and inflicting wounds with sharp objects. As a owner of two small pet dogs at home, I know how childlike they are--innocent, intelligent but trusting and loyal, playful, loving, always wanting to please, and appreciative of creature comforts and treats. How a human culture treats helpless animals is a measure of its progressive evolution, and Nepalis (especially Kathmanduites) can be compared to Neanderthals, occupying the very bottom of today's modern societies. My comparison may be unfair to Neanderthals, in which case I apologize. Why doesnt this good Samaratian start an NGO? Educated collegians should help her start and run such NGO. And we shall contribute generously.....Good luck, aamai!!! Thank you NT for highlighting the incredible work of ordinary Nepalis like Gyani Deula week after week, her story bought me to tears. The 21 dogs she has adopted are really lucky to have a caring and selfless mother and I am sure they will stick by her side till the very end. People like Gyani who have the least resources are usually the ones with the biggest heart and they inspire us to carry on despite the political chaos and the overwhelming negativity in the country. The greatness of the humans continue but i am glad that there are still people like Gyaniji who are preserving our so called humanity. Hats off to her. Gyani has seen people in fancy cars stop, dump the puppies on the sidewalk, and go inside the temple to pray.-This potrays our society very well.I believe some these ppl go back and start lamenting about the country's situation and blame the netas for everything.If we want change,its not a bad idea to take the first step ourselves. you go Gyani! her story is the same as many others who care for our semi-wild community pack dogs... hat's off to all that do. I appreciate what this noble lady has done for the dogs. 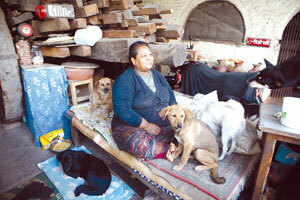 Very inspirational lady with strong sense of compassion, in Boudha also we do have one Tamang Ama who feeds many dogs. May these compassionate Ama's be blessed by Maha Karuna mai Padmapani Lokeshwor, May they live healthy long live. In reality, these compassionate Nepali Ama's are earning great merits for this and for next life to come. This lady needs to be in the competition for the next CNN hero. I am going to nominate her. CNN heroes are about kindness and taking action, especially where others don't tread. This lady is doing both.